Submitted photo Ninety-eight seniors and 26 chapperones from Fairborn High School took a trip to the Big Apple March 23. FAIRBORN — Ninty eight seniors and 26 chaperones from Fairborn High School embarked on the annual trip to New York City. Participants left for the Big Apple following a full day of school March 23. After driving all night, they reached the city around 7 a.m. March 24 and began the trip at the 9/11 Memorial and Freedom Tower. The seniors were divided into “families” and each family made a plan of places they wanted to see. Traditional sites, such as St. Patrick’s Cathedral, Rockafeller Center, NBC Studios and Central Park, included some of the places the families visited. Students and chaperones alike enjoyed a dinner/dance cruise that took them by the Statue of Liberty. A highlight of the trip was seeing the Broadway musical “A Bronx Tale.” At the end of the play, actor and author (of the play which is based on his life story) Chazz Palminteri came out on stage to speak to the audience. After the play, students and chaperones waited by the stage door to get autographs. Palminteri was in his car in front of the theater, prompting Senior Class Advisor Becky Zink to thank him for a show with such an inspiring message. Zink told Palmineri that there were 98 high school seniors there to see the show. Once he heard there were students there, he said he wanted to talk with them and got out of his car. He spoke for a few minutes to the seniors and then told them to gather for a picture. 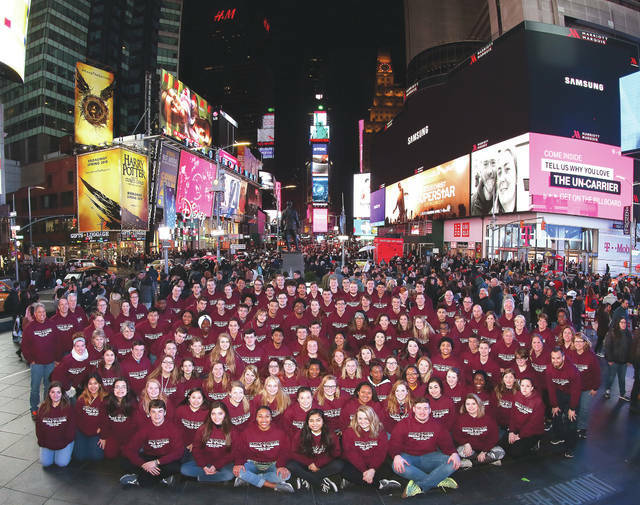 https://www.fairborndailyherald.com/wp-content/uploads/sites/50/2018/04/web1_fhsseniortrip2018.jpgSubmitted photo Ninety-eight seniors and 26 chapperones from Fairborn High School took a trip to the Big Apple March 23.